Enjoy the convenience of having hand-selected, handcrafted wines delivered to your door. 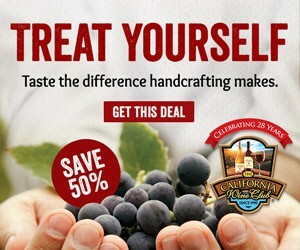 Try any one of The California Wine Club‘s five club levels (including Aged Cabernet) and you’ll save 50% on your first delivery. This peculiar coincidence of Italian names leads to one of the more confusing issues that shoppers confront on wine-shop shelves: Depending on where the wine comes from, “Montepulciano” may represent either a location or a grape; and the difference matters. Vino Nobile di Montepulciano (“The Noble Wine of Montepulciano”) is named for the ancient Tuscan village that the region’s vineyards surround. It’s an upscale cousin of Chianti made from the same grapes as Chianti (Sangiovese, Canaiolo and others) in a small part of Tuscany close to Umbria near Lake Trasimeno. The other Montepulciano is made a long way from Tuscany in Abruzzo, on the Adriatic across Italy from Rome. Montepulciano d’Abruzzo is named for the grape from which the wine is made. It’s a decent but modest table wine that often sells for less that $10, and it shares only its name but nothing else with the Tuscan village and its wine. A Vino Nobile di Montepulciano producer joyously announces a change. 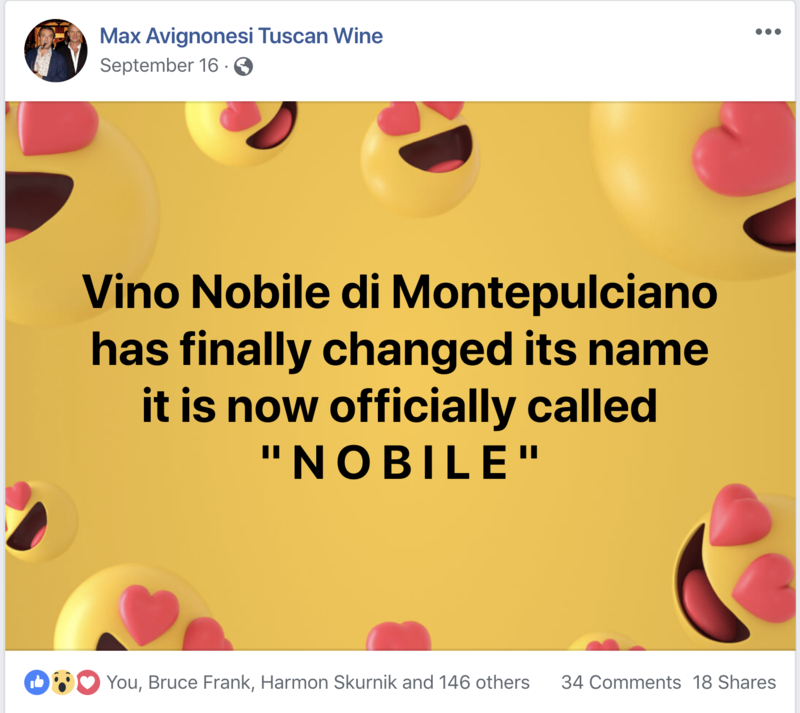 There’s been very little publicity about the change to this point, and I expect it will be next year before the first 2015 vintage wines bearing the “Nobile” label become widely available. But it seems to be firm and final. 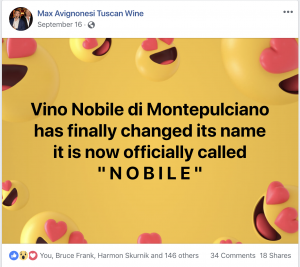 Avignonesi said the change has been approved by the Consorzio Vino Nobile Montepulciano, although that institution, the regional wine industry’s trade group, has yet to change the name on its own website. In fact, the change will initially involve only the six Tuscan wineries united in Alliance Vinum, The (Wine) Alliance, a group of Vino Nobile di Montepulciano producers – Salcheto, Poliziano, La Braccesca, Dei, Boscarelli and Avignonesi – “that believes that now is the time to elevate and preserve a wine of true nobility,” according to its website. And toward that end, while the front label will now proudly bear the name Nobile alone, to make sure no one is in doubt where the wine came from, the back label will continue to bear the full name Vino Nobile di Montepulciano. Just-plain Nobile isn’t here yet, and I wasn’t able to pick up a Vino Nobile in time for this week’s column. But I did discover a nice bottle of the other Montepulciano, the one from Abruzzi, for a bargain $8.99. It’s a bit on the simple and rustic side, but fine with food, and at that price, who’s complaining? 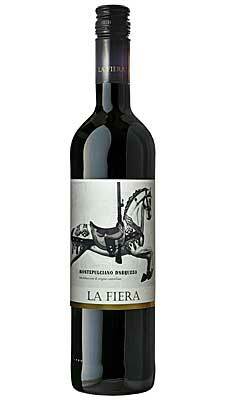 You’ll find my notes on La Fiera Montepulciano d’Abruzzo below. The California Wine Club visits the wineries, meets the families and winemakers behind the wines and then invites them to share their favorite wines with wine club members. Every wine featured comes from a real working winery. If quality and service matter to you, and you’ve been searching for a wine of the month club to try out, give The California Wine Club a try and get to know the artisan wineries they feature. 50% off Offer expires 10/31/2018. Some restrictions may apply. FOOD MATCH: The label suggests tomato-based pastas, pizza and roasted poultry, and I can sign on to all those standard options with Montepulciano. It was good, too, with spicy sausage, although the wine brought up the heat; with creamy cheese, and – perhaps surprisingly – with chocolate. WHEN TO DRINK: The sturdy metal screw cap will help keep it fresh, but this is a wine for enjoying within the next year or two, not cellaring for years. This simple, bright Montepulciano might not compete with more complex renditions at higher prices, but it’s hard to beat for value at Wine-Searcher.com’s $9 average retail. This importer’s link offers basic information about La Fiera Montepulciano d’Abruzzo, with links to more detailed downloadable information. Find dozens of other Montepulciano d’Abruzzo bottlings and vendors on this Wine-Searcher link.